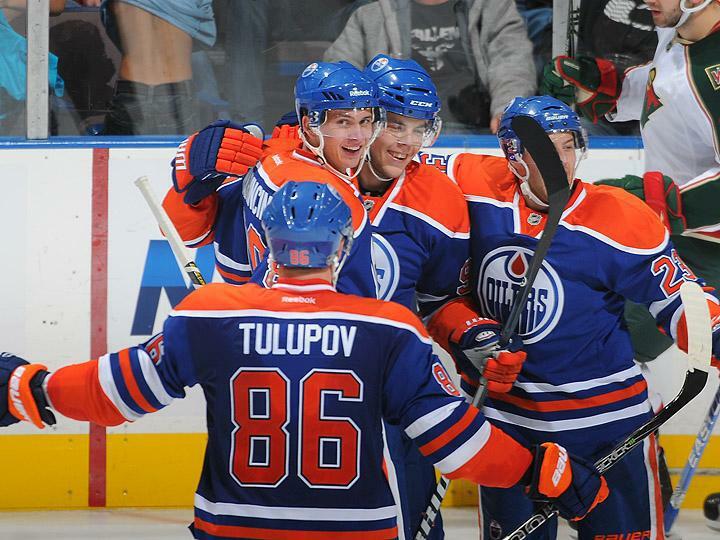 Edmonton Oilers Defence Roster Set? 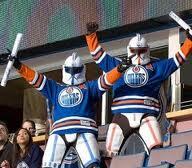 After tonight's massive loss on the blueline, it appears the Oilers defense crew has been determined. Not out of choice, but out of necessity. Smid, Chorney and Fedun all were hurt in tonight's game. That leaves the team with Barker, Gilbert, Petry, Sutton, Peckham and Potter as the only healthy players for opening night. Not a great way to start the 2011 season. I'd assume a call up will be made in morning. I'd expect it to be Colten Teubert. Other options include claiming a defenseman off of waivers. There is a few out there right now, and there will be more to come as camp cuts happen. Could Ryan Nugent-Hopkins be as good as advertised? Is it possible, he is the missing ingredient to what stirs the greater success of Taylor Hall and Jordon Eberle? Can Nugent-Hopkins continue to elevate his game as the competition heats up with bigger and more veteran men? These are questions we can only guess at, but what we do know, is Ryan Nugent-Hopkins has only answered the skeptics questions with success his whole life. Right from his early beginnings, until last night, Ryan has done nothing to show even the greatest of skeptics that he is not a elite player. If Ryan plays beyond his 9 game stint he is sure to get, will he have enough elite level skill to become Edmonton's '1st Calder trophy winner'? I know it's early, I know, Hall was unable to do it, Tavares was unable to do it, no Oiler has ever done it. The competition for the Calder will be fierce this year. Should Nugent-Hopkins be sent back to Jr hockey for one more year, IMO , he would be a lock providing no injuries were to occur. However sending him back, may actually slow down his growth. I hear how some believe, being sent back to Jr can not hurt a players development, but there are many factors not taken into consideration when doing so. There are some (and only a few) that only increase and grow according to the level of talent they play with. I believe Ryan is one of those players. His game elevates as his competition elevates. That is not to say he should stay with the Oilers, I say let his game dictate if he is ready or not. People have said Nugent-Hopkins was able to score and play the way we see in the highlights in this video, only because he was playing against Jr's. That may be so, but he played that way as a rookie his first year at every level. Now entering this season, he played this way against other prospects at the rookie tourney in B.C. Now he continues to play the same way throughout his pre-season. Yes, we are getting closer to regular NHL competition, but my point is , he is only playing better as time goes on. The praise this guy gets from veteran NHL players is amazing. He has already had praises from even Ryan Smyth saying how is vision is so much like 'Gretzky' on the ice. Taylor Hall has even come out now and said how he can play with the big boys. Eberle being more cautious with his words has pretty much said the same. he's a elite level talent, and his ability to think the game at a elite level, is even more important then his elite level skill. He can forecheck well, backcheck well, is incredible in puck pursuit and can come out of the corners with the puck against much larger and more veteran players. His ability to retrieve the puck back upon loosing possession is incredible. Ryan is not afraid of going into the tough places if needed. He is a total package, and the only question that remains, is he 'Calder Trophy' candidate material? Could there be a better candidate to bring home a trophy that has eluded the Oilers franchise their entire existence? It's early, real early, but how can you not get excited about the future, when you see a game like you did last night out of a barely turned 18 year old player. Oh yeah! He just happens to be a EDMONTON OILER! The old school line of Smyth/Horcoff/Hemsky is back together. I suppose this is the best way to ease Hemsky back into the lineup after being out forever with the shoulder injury. Excited to see them out together again. I also look forward to seeing the #1 line of the future. Hall/RNH/Eberle should be a dynamic line for the Oilers. Tonight is another big night for some players still in the Oilers rotation. It's another opportunity to showcase and show management and coach's what you can offer. There is very little wiggle room up front. As much as some want to say there is lots of play for forward positional movement, it's limited. A lot still depends on Gagner's injury status and Eager's injury status as well. If those two are ready to go, you maybe have one position you can flex with. Outside of that, it's the blueline where the audition for a roster spot is. Whitney is looking more and more like a scratch for the opening night roster, so that opens up another opportunity for one of the players originally slated to head to OKC to open up the regular season. Let's continue to look at a few more players and how they have fared up to this point in pre-season. Taylor has been a impressive player up to this point. As has been pointed out by many of the MSM and bloggers alike, Fedun has caught many by surprise and if you were asking me, I think he has taken management and coaching by surprise as well. at the 2011 Summer development camp, Taylor did not look really impressive. His skating was average at best and his effort level appeared to be less then impressive. His passing was crisp but on the other hand, it was a development camp. Obviously Taylor took the skills he was learning and worked on them. It was like a light bulb went off or something. I was one of those 'wait and see' guys who thought his game would falter as the competition increased. That actually has looked the opposite. Granted, he has made a few errors along the way, but with a offensive puck mover you will always have some errors you have to live with. Visnovsky was a prime example of that. Many forget, there were not many games where he was error free and did not cough up the puck at least once in a game. On the other hand, you knew with every rush up the ice and sweet crisp pass, tape to tape, there was a scoring opportunity for someone. 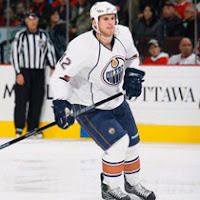 While it is still likely Fedun will be sent down to OKC soon, I do think he has shown enough to management and coach's that should they need a puck mover, he is only a call away. I would think he will get one last game in here before heading down to the AHL. If he remains for more then one game? Well, doesn't take much to add 1+1. It would mean, he is being considered for a opening night spot. At this stage of his development, I would think they want to give him more playing time and see if he can keep this up consistently. It has taken me some time to warm up to this player, but I have to say, Potter looks good. Rather then go look for some cast off from another team on waivers or sign some older veteran who no one is signing, I say give Corey his shot. He's a big boy, plays the body well, not bad wingspan. OK skater and is decent at moving the puck up the ice. My apologies to Lowetide for doubting this player. Lowetide has been high on Potter (sounds funny huh?) for some time and I now see why. Of course this would mean that Chorney would be heading through waiver wires to get to OKC. If Chorney stays, most likely Potter heads to OKC and is first defenceman called up. If Whitney does not start the year, I would think they will want Petry up with the Oilers for his puck moving skills. The blueline may not look real strong in Edmonton, but take a look down in OKC and things start looking up. How can you not like this guy? I saw some video's on him from Finland, read articles, saw stats and was more concerned with how many penalty minutes he was getting. I was under the impression he was a 'wannabe' hockey player. This guy has impressed me to date. Not only can he get around the ice, but he can check well, handle the puck not bad, knows how to pass and even has a decent shot. Plays tough on the forecheck and backcheck. Depending on injury to bottom line, would be a dependable player to call upon. OKC is going to love this guy. Cuts have been made today and its time to try and figure out who will stay and who will go. This is probably harder to do this season than any other season the past many years in Edmonton. I will start byadding the players that there is no doubt about making the team. That list would include Hall, Eberle, Paajarvi, Smyth, Hemsky, Horcoff, Belanger, Eager, Gagner, Jones, Hordichuk, Gilbert, Smid, Whitney, Barker, Sutton and Peckham. Ryan Nugent-Hopkins - RNH has proven this pre-season that he can play in the big league but do the Oilers have room for him? With all the centers in the organization right now the easy answer is no but that can change in a hurry. Move Gagner to the 3rd line or make a trade and a spot opens up. RNH will get his 9 games for sure and after that it will depend on him. If you ask me then yes RNH will be on the team. How many number 1 picks have not played in the NHL the year they are drafted? Teemu Hartikainen - Hartikainen is just what the Oilers need. A big body who has some skill and can play on a top line or a 4th line. In a perfect world he would be on the team to start the season but this is not a perfect world. Hartikainen will have to settle for an early call up and make his impression then. Anton Lander - Lander just like Hartikainen has proven he can compete at this level of hockey but just like Hartikainen Lander will fall out of the Oilers roster. Again you can expect early call ups for Lander to make his impression. Jeff Petry - I do not see Petry as a 7th defenseman. Petry should make the team but will need to be a top 4 D-man. If used as anything less then Petry is better off in the AHL where he will get the minutes. Taylor Chorney - Chorney needs to be a more physical player and I don’t see that happening. I would expect Chorney would be the first call up for a D-man. Kirill Tulupov - We all know Tulupov will not start the season with the Oilers but he is a big body and good hockey sense. I am putting him on this list only because I do believe he will be a call up. I could go on and add a few more names to this list but honestly I just do not see the need. In this bloggers opinion no other players have a shot at the big club. Maybe im wrong and time will tell. Whose to blame on an illegal hit? I feel its time I speak on illegal hits in the NHL.To do this I am going to take some of what Wayne Gretzky recently said while visiting Edmonton and also what my own views are on the matter. Most of you who have been following me on twitter for some time know how I feel. In many (not all) cases the NHL needs to call out the guy getting hit. To many times you see a guy turn his back at the last minute hoping that either a) he will not be hit, or b) he will be hit and the player hitting him will get a penalty creating a power play. There is an easy explanation for this. Hockey Canada has for a long time now put a stop sign on players backs reminding opposing players not to deliver a hit from behind. These kids quickly picked up on this and started turning there back to opposing players knowing they are now untouchable. Is it really a shock that this trickled into the NHL? Here is a simple solution. When the NHL investigates an illegal hit they should look at how both players acted leading up to the hit. Did the hitter have time to stop? Then sure suspend him but how about if the opposing player turned his back at the last second or was not paying due attention. Then throw a suspension his way. I can almost guarantee that if the NHL took this stance not only would concussions be down but these types of hits would drastically be down also. This is the only way I feel the issue will be resolved. If your going to wait for the players to respect each other and not deliver these hits then we can discuss this in another 100 years because things wont change. If suspensions get to out of hand then all that creates is more players putting themselves in position to be hit hoping to draw the penalty or suspension. Only a few more games left in pre-season and early observations and others forms of hockey entertainment will be over. As I was writing, 12 more cuts came to the line-up and more will be sure to follow Wednesday morning. I was impressed with some of the defensive work we saw from Taylor Fedun and Corey Potter (will cover those two in 'Early Observations pt3'). Always nice to beat Calgary, even if it is only pre-season. Just something about bragging rights for Alberta isn't it? I won't be covering every player just some of those who have had questions on them. Lennart is a interesting player with what he brings to the table. If Gagner is unable to start the year, I see Lennart making the opening night roster with him and Hordichuk interchangeable, as the 13th forward. That would mean Brule would be centering the fourth line. Should Gagner be ready to go, chances are, he will be moved to wing on the fourth line and interchangeable with Hordichuk. Lennart has proven with pre-season competition to be good on the penalty kill and a strong forechecker. I am concerned about his lack of control with his body. When flying on the ice, he looks like all arms and feet are flying but not lots of control. That could spell problems with a stronger opponent then he has seen in pre-season to date. I also have noticed he will take himself sometimes out of position to make the hit on the boards. Again, that can be a risky measure with this player. I like him, like his fight and passion, just concerned if he will be able to maintain his effort as the regular season comes around. Anton has done well in the time he has played in games, but the competition is starting to toughen up. Sure he had a bad give away last game, but it happens to the best of players. the next game will be even a better test of his development and growth. This will most likely make me a public enemy of Oiler fans, however I really do think as good as Lander has been to this point, he will be sent down to OKC. There are a few area's Lander could use time to work on. Coming from another country and jumping full-time into the NHL with limited ice time may not be in the best interest of Anton at this time. Sure he can play 9 minutes a night on the fourth line in a shutdown, or energy role. Is that better for him then 1st or 2nd line action in OKC with more skilled wingers and playing 18 minutes a night? Even without Gagner in the lineup, I truly do think he will get a short stint down in the AHL. Don't worry Lander fans, when Anton returns to the Oilers lineup, I do not see him going back down again. On the other hand, if your a OKC Baron fan, this is exciting news. Can't see Brule being sent down through waivers so this is probably a contract situation he is being thrown into as well. As I was getting ready to share my observation on Kirill Tulupov, the roster was trimmed and he was assigned to OKC. I was thinking he may get one more pre-season game in before they decided if they were going to hang on to him for the organization or not. Obviously, that game was not needed and they will be continuing his tryout down in OKC. I thought I would still post my observations on him as he very well, could be a potential call up if our defence resembles a M.A.S.H unit, as it has in years past. While on occasion Kirill can get himself out of position by going for the big hit, I do believe his game can be altered some with a little coaching. He comes across as a player just wanting a chance on the blueline and in the Oilers organization there are many opportunities. I like this move myself and with Marincin being returned to the WHL, another contract spot opens up for Tulupov. He will have more training camp time in OKC to prove to the Oilers they should hold onto him. 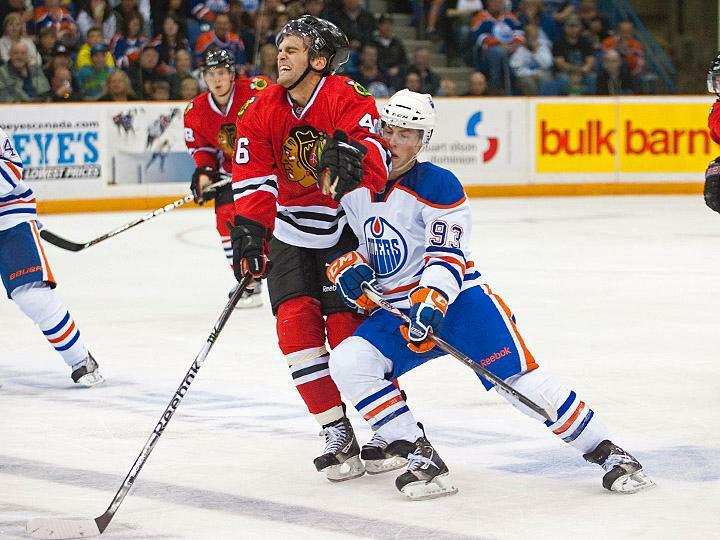 Lennart Petrell To Make The Oilers Squad? I didn't get to watch the Oilers game yet (recorded it with PVR), but I did listen to the game on my iPhone. An interesting tidbit from Bob Stauffer was thrown out there. He says that it's very possible that Lennart Petrell could make the team. 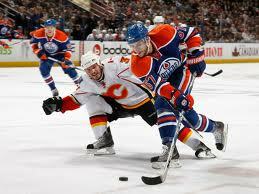 With his fearless playing and his ability to go on the penalty kill, Bob claims that he's just what the Oilers need. I suppose it is possible that he cracks the lineup (Bob is seldom wrong), but to me personally, I think it's a stretch as the team is pretty well set. I guess we will see in a few days, one way or another. Some interesting notes. Horcoff is once again paired with Paajarvi and Omark. Looking like this will be the opening night 3rd line. Brule with Hordichuk? 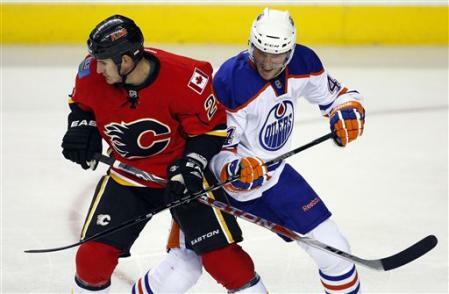 Are the Oilers just seeing if there is chemistry between those two? Or nothing at all? Sounds like Devan Dubnyk will play all 60 minutes. Four games into the pre-season (half way) and time for some early observations? At least with most players having already played at least two games, there is some indicators as to what we can possibly see brewing, as far as rosters both in Edmonton and OKC go. First of all, I don't think anyone is fooling themselves into believing this Oilers club is a legitimate play-off contender this year. Could they challenge for a play-off spot? Possible, but it's also possible Kevin Lowe and Brian Burke will sit down over a friendly game of 'Risk'. (always loved that game)All joking aside, this is another year of rebuilding and while we all want to see great strides in improvement, it is a process. Before I comment on some of my early observations I think it is important to note a couple things. 1) It is good to not evaluate to hard on a player's first game in pre-season, as sometimes they need that game to get the rust off. Timing and chemistry, sharpening the mind is important and sometimes it takes a game. It's how they respond back the second game that matters more. There is a requirement in most cases to see that game improved upon in the third game as well. 2) Seeing a player succeed in their first pre-season game can be a great site to behold, but they really need to show it again for at least two more games. That shows the consistency that is needed from a player. This is only a rule of thumb, not the "guidebook on how to evaluate". Every few days, I will continue to share my observations on a few more players during the pre-season. It can be so easy to assess RNH's game by points alone. Fortunately for RNH , he is doing ok in that department. 3 Games played, 3 Points. Not to mention the opportunities he has been getting, or even the great set ups he has given other players who were unable to finish. Has he made some errors? Absolutely he has, but as any player on the team, if you look hard enough there is mistakes. What you will not usual see from RNH is repeat mistakes. He is a astute learner, catches on quick and thinks the game a couple steps ahead of most players, even at his young age. His ability to play harder and smarter on the puck in the forecheck is still looking good with each passing game and his work ethic lacks nothing. He works hard to play that 200 foot game and prides himself on making that part of his game even better. Watching him on the ice can be deceptive to some, as he looks rather disinterested at times, but it's actually because he isn't chasing the puck, he's covering his lanes, anticipating plays and playing smart and waiting for the breaks. He really lets the play come to him, even on the forecheck. Many people believe he is having a quiet game, when really he is just playing smart and waiting for the moments. What is the moment? It's the pressure moment in my opinion. RNH always seems to play better the more pressure he faces. It's still early to know if RNH stays in Edmonton or goes back to Red Deer, but at this point, he has shown nothing to the coaching staff to suggest sending him back. As has been said several times already, it's a process, and to date, that process seems to be on track. Some food for thought. 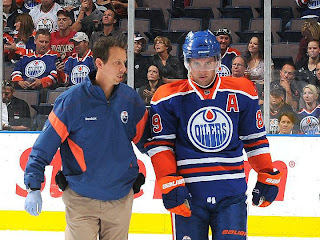 How do we know Ryan Smyth will be in Edmonton next year? Nothing is certain and if he does not return, what about the whole Smyth mentoring Nugent-Hopkins theory people have put out.? For me, unless RNH shows he isn't ready, Smyth is the mentor he needs. Horcoff did well working with Hall and Eberle, but they also were wingers to play with the Centre. RNH is a Centre who needs a winger who can mentor him and Smyth appears to be the perfect fit. Just a observation, nothing more, nothing less, but food for thought for sure. When can you last remember Teemu playing a bad game? Is that not the question that should be asked? As Robin Brownlee even tweeted Saturday evening, 'how can Teemu not be in the lineup?' You would hope that just because of contracts, you don't want to see Teemu growing his game in OKC (nothing against OKC, it's a awesome place to play and visit) when he is already playing better then several players slated to be in Edmonton on opening night. Injuries can change this whole scenario really quick, but Hartikanen brings the Oilers the type of player they truly have been lacking for some time. Two games into the pre-season and he continues to look like he is continuing where he left off at the end of last season. Nikolai struggled in his opening night ice time and to be fair, his defence didn't do him any favours. Fans, media, bloggers all got after him by nights end. (OK, not everyone) In fact if he had 20 supporters in the city of Edmonton, I would be surprised. I didn't like what I saw but as I have mentioned in other posts. One game (especially the first game they play in pre-season) is not a accurate picture of the player and his skill. That second game and third game will really show a much more accurate account of what we have to look forward to. In defence of KhabibulinNikolai kept this game in reach throughout the night. That's what he was originally brought in to do. Good on him, but what is now needed is another good outing like his Calgary outing. A second consecutive solid performance will shows the arrows are pointing upward for him. Falter in your third pre-season game, no matter how good you played, it's only a faint memory and it may be the beginning of the end. This next game will give us the best indication as to where Nikolai's game is at for this coming season. At BE THE GAME, we believe in the power of sport and what sport provides and teaches our children and what that they will carry with them throughout their life's. Through our brand, we are proud to promote the power of sport to communities, teams, families and individuals abroad and in doing so we give back! This is why we have launched the "Power of sport, the power of ME" campaign! In North America, the stat is that 1 in 3 Families cannot afford minor sports for their children! With our campaign, our goal is to assist as many of these families as we can but we need your help to do so! 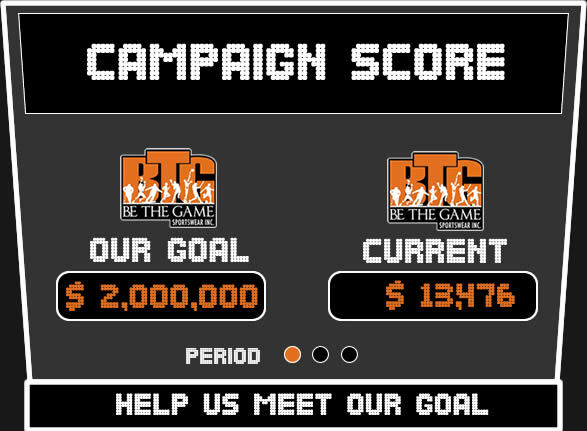 Our goal is to sell 1 million BE THE GAME "power of sport" decals to raise $2 million dollars that will go directly to child development through the power of sport! How can you help? Purchase your vehicle decals today and pay it forward! Ask your friends, family, colleagues, neighbours, and sports teams to do the same! Simply click on the "Buy Now" PayPal icon and order your decals today and know that you are becoming a part of the solution in helping disadvantaged children play sport! If you have a business and would like to support our page and campaign, please contact us today to found out how you can add your company to our growing list of organizations that believe in the power of sport and that all children deserve the opportunity to play. “Dear Joe Drexler and BE THE GAME Sportswear. "I am honoured to be a part of a company committed to assisting those in minor hockey the way Be The Game™ has. Joe Drexler has created a great product on a foundation created by solid principles and values. Giving back to minor hockey and other minor sports in any way I can is important to me as a person, just as it is important to Joe and everyone at Be The Game™." HOW CAN YOU MAKE A DIFFERENCE TOO? You have several options on what you can do. Either purchase a $5 Be The Game vehicle sticker like I did or you can purchase some of the cool clothing that BTG sells. Just go ahead and visit the website. They do an excellent job at BeTheGame. Yes I know its early and yes I know the Canucks dressed a shameful roster last night but RNH has shown that he deserves to be an Oiler. The little things that he does on the ice will eventually turn into big things. RNH has shown that he has great vision on the ice with great passes to Smyth and Eberle, the way he strips opposing players of the puck and his defensive play. 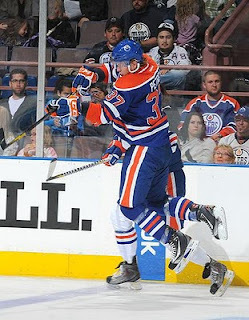 RNH has done so much early on that even Ryan Smyth is impressed. “Not only is he a humble kid away from the rink, but he sees the ice very well” said Smyth. “He has great speed and the puck doesn’t die with him, he makes a lot of great plays. Those are the type of things you just can’t teach". 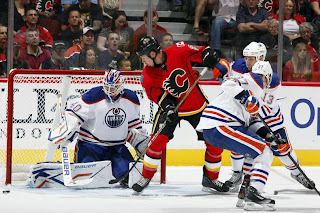 The Edmonton Suns Robert Tychkowski put an article up today (and I quote) "Ryan Nugent-Hopkins, making his pre-season home ice debut, had a relatively quiet night, assisting on Eberle's goal for his only point of the game". Really? what game was he watching? Or maybe it is all about putting up points for Mr. Tychkowski. Did he not see the 3 or 4 great passes RNH made to Eberle or how RNH stripped opposing players of the puck? I just don't get how someone payed to watch the game missed that. The only knock I see on RNH is his faceoff ability but that will come. How often do you see a young kid that is great on face-offs? Its something you get better at with experience and age.If RNH wants to remain an Oiler for the season all he needs to do is exactly what he has been doing the first 2 pre-season games. I had been working on this for a bit already, so thought I should wait it out before starting to blog more on this topic. However, while I have been waiting for things to settle in regards to RNH, the masses have started before me throughout the blogging world and all over the scouting agencies. "Rev's Top 15, Oilers 2012 Draft Watch"
Many seasons in the past, most Oiler fans had no clue of the players available to pick from in the NHL entry draft other then what they had been fed the last few months leading up to the draft. My thought is, 'Why not follow the higher ranked player's ourselves'? I mean, doesn't draft time seem a little more exciting when you know more then 2 or 3 available players? If the Oilers can improve say 5 spots and pick 25th in the 2012 NHL draft, would it not mean more to us as Oiler fans if we were a little more educated on possible players to draft? So, having said all that, I came up with the idea to have a list of 15 players to rank throughout the year, which we can all possibly follow. Starting the first week of the NHL regular season I will be posting "Rev's Top 15 Oilers 2012 Draft Watch". This should be fun and also very interesting to see the development of the players and their progression throughout the year. I generally have done this on my own the past couple season's, but look forward to having more time to really dissect the class of 2012. Week 1 will be my rankings, followed by the 1st over all ranking and so forth, each week, until we have covered the top 15 I will be listing. At the end of those ranking, I will give a updated ranking. (estimating that will be in late January) Should there be new players who have jumped up in their ranking, we will take time to discuss more on them as well as those who may have fallen back behind my original projected top 15. As the weeks go by, I will be giving little updates of games, injuries and anything of special note on the various prospects via twitter. Summer is over and hockey is back. Could things be any better? 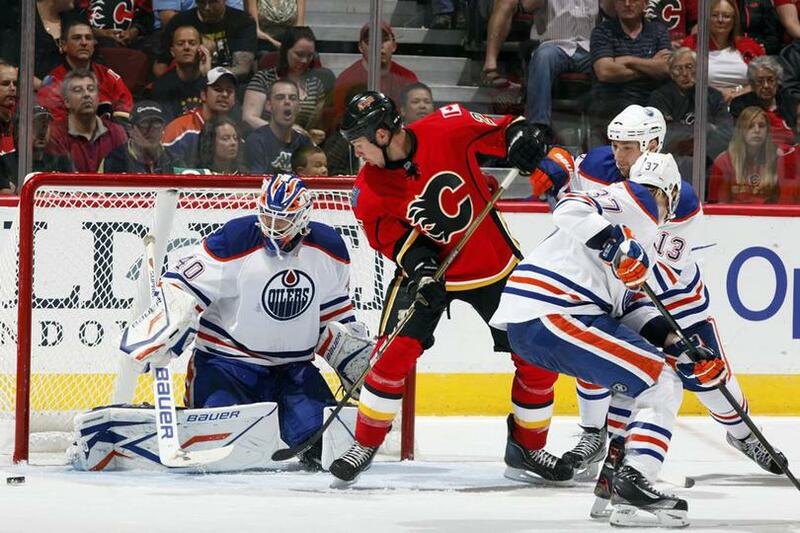 The Oilers made many changes over the summer, some good and some not so good. I will go in depth on some of the moves and what I see happening with the Oilers this season. 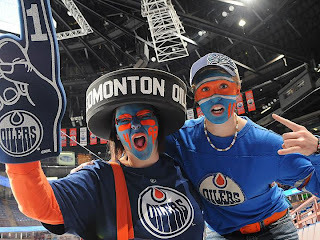 This is my first blog for Oilers Jambalaya and i have not blogged much the past year so be nice lol. Letting Cogliano go could end up being the worst thing the Oilers have done the past few seasons. Cogliano is young and has shown he will be a reliable 2-way player. The Oilers seem to have a history of giving up on players when they are still young. One example would be Jason Arnott but there are many more. Sam Gagner holds his future in his own hands this year. To remain an Oiler he will need to step up his game. Nothing short of 55-60 points will do and a vast improvement on his faceoffs. The Oilers simply have to much depth at center after the free agent signing of Belanger and RNH being drafted 1st overall and Gagner could end up being the odd man out if he doesn’t impress the coaching staff before the trade deadline. Its much to early to tell but from what I have seen from Ryan Nuggent-Hopkins I can honestly say ive been very impressed. The little things he does on the ice adds up to a lot. Hopkins sees the game better than I ever could of imagined he would at his young age. 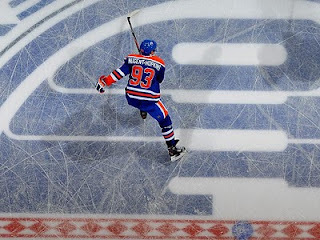 Yes it is early with only 1 pre-season and 2 rookie games under his belt but he has shown signs that he will be every bit the player the Oilers hope he will be. Ryan Smyth could be the best thing the Oilers did this summer. Not for his offensive skill but for the way he plays the game and how the young guys will see that and know what needs to be done to win. Smyth plays 100 percent every shift every game. He is willing to take a beating in front of the net and never scared to make the hard play. If even 1 or 2 of the young guys learn something from Smyth then bringing him back will have proven to be a success. Anton Lander is another guy who has really impressed me early on. He is a guy with good hands who is willing to do what it takes to win. As Dan tencer tweeted “Lander hates losing as much as anyone ive ever talked to.Guy despises it”. Is that not the attitude we need to see more of in Edmonton? Defence is what scares me about the Oilers. There was a time when fans thought we had to many puck moving defenseman and a short few years later we are now begging for one. I cant help but think that if we would have kept Grebs two seasons ago he could be that guy. There are some young guys who look like they will eventually step up on Defense but as we all know it usually takes years to develop a defenseman so a trade may be the best option here. I will say however that I was impressed with Petry at times last season and with Tulupov getting an invite he could work himself into the rotation by seasons end. 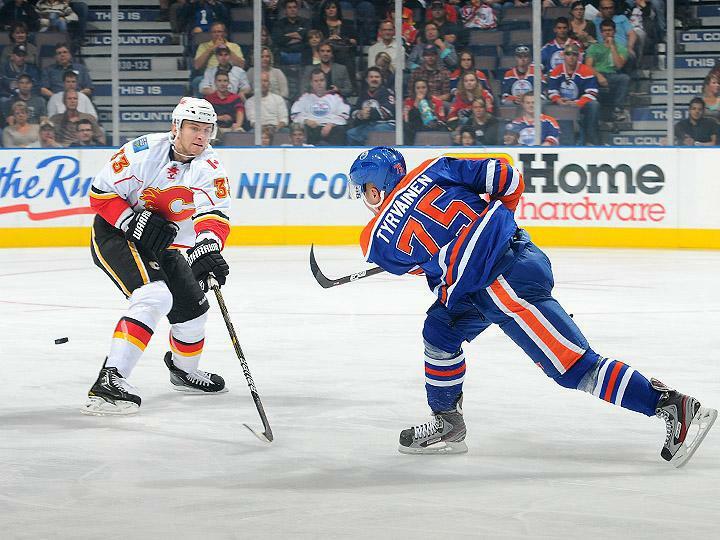 The Oilers also have a couple other young guys who could step up. 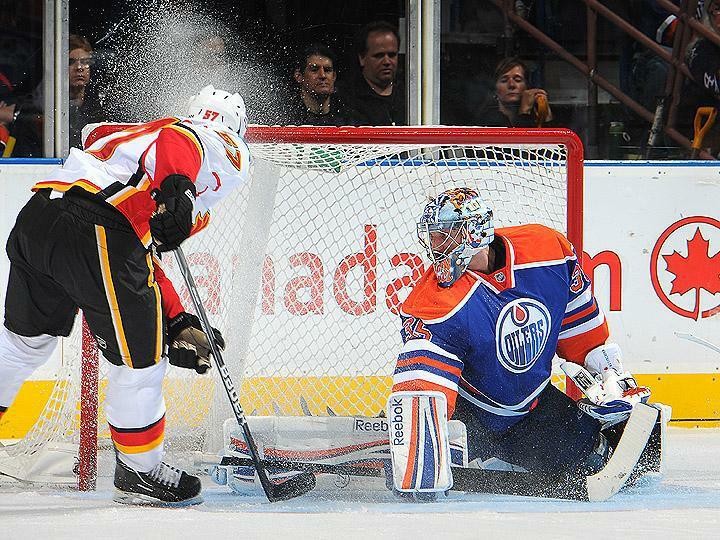 Another big question about the Oilers comes in goaltending. Can Khabibulin have a bounce back year? Is Dubnyk ready to be a starter? I see Khabi having a good year yes but he will only play 40 or so games this season with Dubnyk getting the remaining starts. I just don’t see Dubnyk ever becoming a true number 1 but I have been wrong before. I see him becoming a good back-up and feel the Oilers need to go after a true number 1 after this season. Overall my way to early to tell prediction would be the Oilers finishing in tenth or eleventh spot in the west right behind or ahead of the flames. I see Petry earning a spot on the roster while Lander, Tulupov and Hartikinen getting early call ups due to injury. What if the fate and the future of the Edmonton Oilers was in your hands? What if it was up to you, to decide the next decision as owner, President or General manager of the team? Would you use the wisdom of the scouts, coach's and manager's in making big decisions? Or would you give the fans a chance to voice their vote, give their opinion? After all, we know the fans can't be wrong. Or can they? Well, it was a interesting night on many accounts. Got a chance to take in the one game at 'Rexall Place' tonight and came out happy to see hockey again. I will admit, after the first period, I was just glad to have hockey back, but was starting to get that feeling of 'here we go again'. 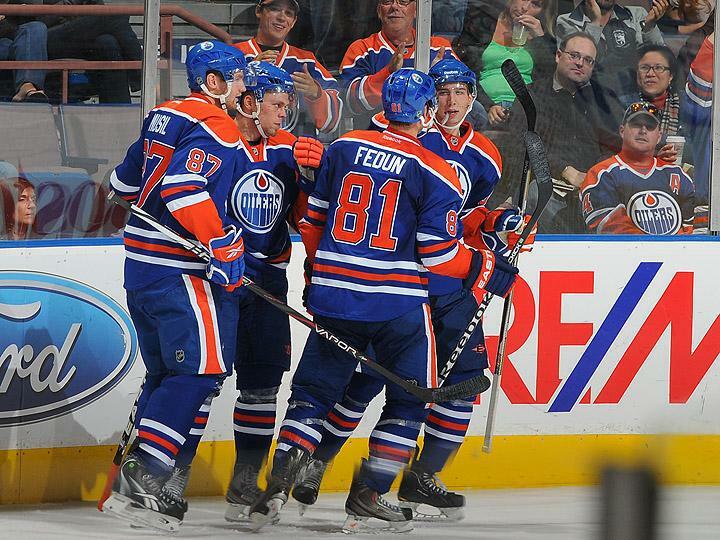 Turned out, the Oilers got back into the game and started really making some things happen. All in all, it was a good night. Enjoyed the folks around us, talked lots with Oiler fans, filled them in, on lesser known players and even got to cheer after seeing some goals scored. I planned to listen to the radio broadcasts on the way home to get updated on anything from the Chicago game in Saskatoon and then catch the game replay from streaming video online. Upon getting home, I find out I can't see the replay of the video feed. Also found little information was given. In fact I had more information from twitter then I did anywhere else, including sports radio coverage. For me, the Oilers dropped the ball on this one. Felt more like this was about working on the team game for the players and less about the fans. I can get it, but one problem with that....'the fans pay the bills". So with saying all that, I just want to let you know, I have very little information from what happened in Saskatoon except the limited highlights. The game itself here in Edmonton carried a lot of mistakes from both teams early on. Once the players started getting their legs going, the cob webs started to unsettle and it started looking like a NHL hockey game. We all know it's the first game of the year, players are trying to get their legs going and establish chemistry with line mates, not to mention just get their timing down. It was exciting to see the 'All Swedish Line' do well. Sure they took 4 penalty's but again it's pre-season, it's the time to get that all out of the system isn't it? Fedun played another great game until taken out by a boarding hit by Powe. 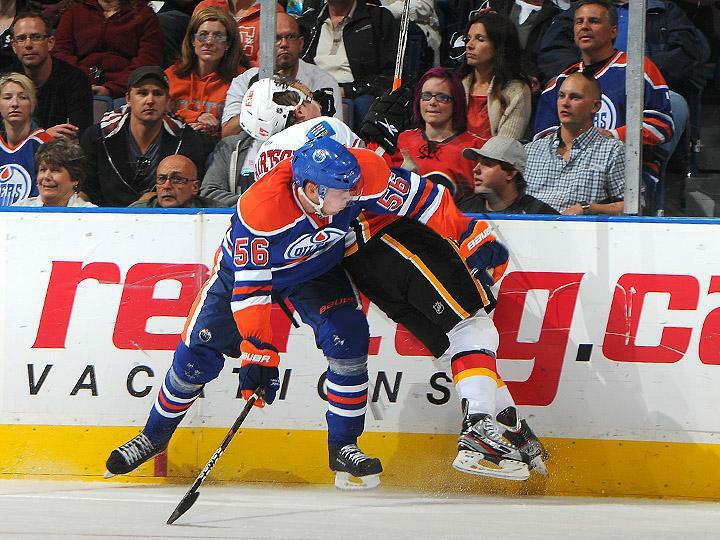 Hordichuck laid a crushing check and had to face Kassian in a fight to the ice. He held his own even though he was definitely out sized in this one. What was his secret to staying in the fight and not getting his face messed up? Throw way more punches then you receive and don't stop til it's over. Seriously, he may have lost the fight, but besides his helmet sent flying by a big punch by Kassian, he was speed bagging (except rarely hitting much) Kassian. Would have been exciting to see a overtime match the first game of the year with real competition but you can't have it all on the first night can you? 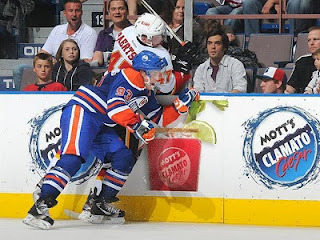 In Saskatoon, the 'Nuge' along with Smyth and Eberle stole the show by the sounds of it. Except for Josh Green who would not be upstaged this night. He appeared to do well on the scoreboard despite his limited time on ice. Smyth looks to be a ageless wonder (let's hope that continues) Eberle looks to still have the 'Midas Touch' and RNH continues to show why he was selected #1 over all in the 2011 NHL Entry Draft. Coming back to my opening comments. What if, it was really up to us fans to decide who stays up and who does not? The reason I bring this up? Well, after reading blogs all summer, see all the comments by fans, read the opinions by scouts and the so called experts, I really do believe that many of us believe we can make decisions for this team better then management. I am not saying this to get your hair up and to start a debate, but c'mon Oil fans. Actually, it's not only us Oiler fans, it's the MSM as well. The problem that I am seeing is, the opinions are not balanced both ways. (ok, I know, that's my Opinion) Let me explain. If someone plays well in pre-season, people get all excited and start believing their the next ( fill in blank). Of course , some will say, wait and see. let's see if this player can carry this through to the regular season. OK, that's fair, let's do that. But what about the other way around? What if they struggle early on? Could that not be the actual player just shaking off the dust from a season off? Can't we give them till the regular season and see where they are at? I guess what I am saying is, how can we jump all over a player cause of one bad game, yet in the same breath , praise another player cause of a good game? Is it not a wait and see for them both? Now granted, based on practice, based on previous years and background, we may already (management I am meaning, not fans) know their potential ceiling or lack of. However if someone is not known to fare as well in their past history, yet has one good game, should that not be considered? Past history tells us a lot about a player. If a player is known to show signs they are lacking in a area of their game and it shows in the pre-season game, chances are good, they have not improved enough to warrant a continued look. On the other hand, should a player show continued improvement and elite level skills throughout their career to date, a good showing in a pre-season game, could be a sign that player is showing exactly the player they were thought to be. Confused yet? I think I am almost confusing myself. My main point as a fan is, 'why do we think we know more then the actual management, coaching and scouts?' I have no problem someone arguing a point that has some merit and thought process into it, but let's be realistic here. There are many factors to making a decision as to who will be in the Edmonton Oilers roster for the duration of the year. The best example I can use is the 'Nuge'. Tonight at the hockey game I had a discussion with some folks about the possibility of RNH staying with the Oilers or being returned to Jr's. Either way, he WILL be a Oiler. If not this year, then next year for certain. It doesn't matter to me either way, however some are already sending him back to Jr. My only question at this point is why? If you told me, we will wait and see how he fares against tougher competition, I would be ok with that argument, but to say he has to go back, because he is too small? Really? Is that all you got? I have already covered some of the argument to that in a earlier blog called "Ryan Nugent-Hopkins, Ready for PRIMETIME?" How do you decide if someone is too small? Because their too Short? Too Slender? Too Lanky? They look like a teenager? 'Sorry kid, back to Jr's for you!' What if they are a better player then your other option's? You still send them down? I understand Entry level Contracts, One way contracts etc...What I don't understand, is why some so adamantly believe they know better then the professionals who make a living doing this. Give me good meaningful reasons why RNH or anyone else for that matter should be sent packing at the end of camp and I am all ears. Just use reason and logic, not senseless thought statements. The one statement given to me tonight on why RNH needs to go back to Jr's (you know who you are, Mr.Hemsky fan) was, "A friend of mine who works in the medical field says RNH is TINY, no way he can take a hit without being crushed. He has to go back and get bigger". Maybe he is right, maybe he needs to build up his core strength more. I don't know, all I can say is, til this point, he has looked pretty good. The 'Nuge' has shown nothing to the Oiler staff that he needs to go back to the Red Deer Rebels. Now that could change within a game or two, but right now, he continues to perform and perform well. All hail "the NUGE"! 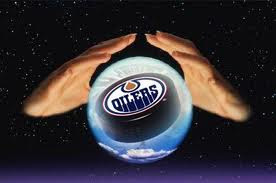 If the Oilers were in your hands, what would you do? What is your logic behind your decision? What about Hartikanen? How about Lander? Tough decisions that can affect the future of your club if not handled properly. For me, I will leave that up to the Oilers management and continue to sit on my soapbox, yelling and judging every decision the Edmonton Oilers make. In the meantime, and in between time, that's it, for another addition of 'hockey tonight'! EdmontonOilers.com is now iPhone and iPad friendly. You can watch the videos and they now have an app for your phone or iPad. Simple to use and very user friendly. I can't thank the Oilers enough for doing what they had to do to make this happen. Our lives just got easier. **THERE IS NOT AN APP IN THE APPLE APP STORE YET** Go to EdmontonOilers.com to get the mobile iPhone version. All we need now is an Oklahoma City Barons app. FYI, there is a Stockton Thunder app for the iPhone. 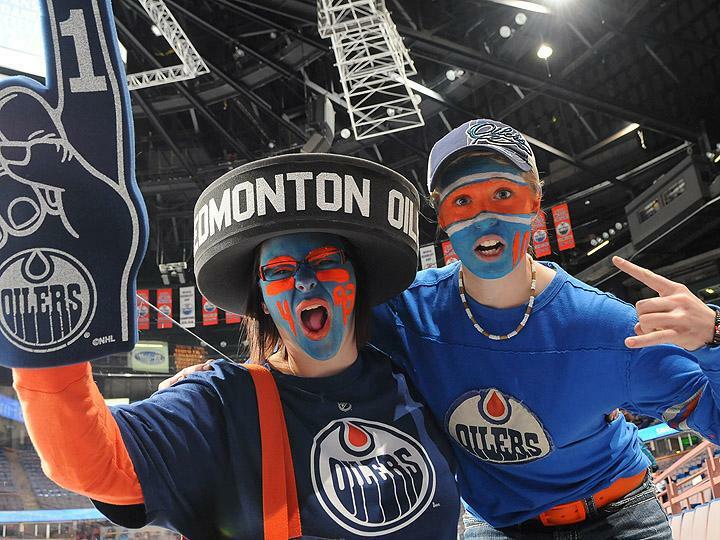 Oil Country to go Crazy mad hockey on you! With the Joey Moss Cup now behind us for 2011, the season is about to start. The Oiler's first two pre-season games take place tuesday night September 20th/11 with split squad games. One at home and one game away. It's showtime! While the team's opening roster has not been fully decided yet, the action begins and this will be the first competition of the season for the Edmonton Oilers Veteran's and Rookies. This is where, the rubber meets the road. It's where boys become men, or they go home. There is nothing like the fresh smell of sweet Oiler hockey to get the juices flowing. Got the chance to get out to the Joey Moss Cup and see some of the players for myself tonight. Was a enjoyable game to sit back and see some hockey once again. Hitting was limited, but it gave you a early indicator of where fitness wise, skill wise and game ready the team as a whole is right now. Some players will soon be sent back to jr hockey, some will maybe just be let go, others will be assigned to the Stockton Thunder and others to the OKC Barons. The remainder will get ready for the regular season. In the meantime some players are going to show the coach's and management exactly what they got. As much as the game was a early sign of some of the skill sets the players possess, it also is too early to read too much into what was seen. A game against another team is what the dr is ordering if your looking to really see where this team is compared to last year. I am sure if your reading this post (many hours following the game Sunday afternoon) you have already saw highlights on the net, on tv or read the many articles that have already hit cyberspace. Interesting thing about watching player's and then giving your evaluation? You can sometimes hear two different opinion's yet they saw the same game. It's all perspective sometimes, other times it can be difficult to follow so many players at the same time, so you may have only caught a glance of the play that actually occurred. Some players I was unable to cover as I just couldn't possibly get enough notes down to cover everyone. needed some time to get his legs under him. Was not that noticeable until near the end of the first. Worked hard on the back check which was an important area he was needing to improve on in defensive zone coverage. On a couple occasions played some with Nugent-Hopkins in a give and go, but otherwise a quiet night. Renny sound pleased in his post game interview with Omark. I would actually say that I felt Ryan Nugent-Hopkins looked to have the best game of the group if not for a 3rd period giveaway that almost resulted in a goal. Otherwise he looked good in the faceoff circle (I estimated he was 5 for 8 in the dot) as well did a superb job on the PK on a couple occasions. Late in the third with team white pressing RNH took on Hall one on one and held him at bay. If anything, he is looking good at his defensive zone coverage. This was an area he did well at already, but few have given him credit for. He made a few nice offensive plays, however he didn't seem to find much chemistry with the two swedes. He displayed his brilliance and skill at puck retrieval on the forecheck today which had some "ahhs" from the crowd. Definitely is good at slowing the play down. Interested to see how he does tuesday night when the speed picks up more, the checks start coming and he really starts competing for the centre spot. Played a great game and as usual, was reliable defensively and strong on the forecheck. Makes the game look quite smooth and seems to be ready to go for the year. Hopefully he carries right on from where he left off last year. Great game as he continues to start really ramping up things. Has seem to really get his feet under him and played very well in the centre spot today. Looked to win more faceoffs then he lost and definitely will be trying to make it hard to play him. showed some good foot speed early on. Can tell he has played the game awhile as he seems to find the holes needed to get into for scoring opportunities. Looks tough to play. Should be a excellent replacement in OKC this year. A player to get excited about if your a Barons fan. This guy doesn't seem to know the meaning of 'Quit'. Tough on the puck, skates hard, tries to find the open lanes but will battle hard in the corners. Was hilarious at the end of the game where O'Marra had an open net to shoot into, except Anttti furiously slapped his stick on the ice to give him the puck for the empty netter. Basically stole OMara's goal. I can see the two working as a fourth line in OKC this year. Deceptive quickness out there on the ice. Was very noticeable early on in the game but looked to fatigue some as the game wore on. Not really agile on his edges, but definitely likes to get in on the forecheck. Not sure he will have much of a chance to play in Edmonton, but definitely will get some good opportunities to get noticed in OKC. From my eye, made one big give away in the offensive zone early but was probably one of the better defenders in the game though. 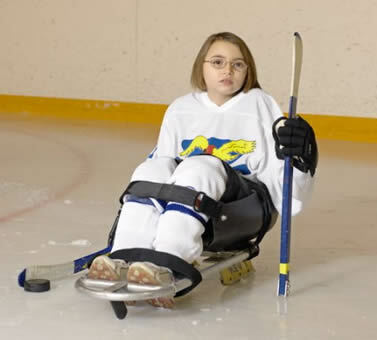 Very smooth skater and excellent puck mover. Was able to get the puck up to the forwards with ease. This is his year to impress, so let's all cross our fingers he lives up to his draft and early career hype once again. Taylor looks to be still getting his skating legs under him. Made a few errors throughout the game and mostly in the defensive zone. Have a hard time seeing him supplant Petry in the opening night roster. Really like his game. Works hard in the corners but today's scrimmage makes it hard to show his tight checking game. Nailed Eager in the corner with a good check at one point. Eager had a few words with him following, but with being on a PTO , I am sure he is more worried about impressing. Could be a player who pushes hard from OKC this year if he is able to get in and be signed to a contract. Along with Barker, Fedun really showed well. His poise with the puck and ability to think the game with maturity was a delight to see. I like his game. Looks to be a excellent prospect. Another great find for the Barons this year. Great big wingspan that covers alot of the ice. he did well positionally when I was following his play but his foot speed still does not seem up to what he is going to need to be at, to be successful in the NHL. Played the second half of the game. Let in a top glove hand shot, but held strong the rest of the game. Very stable and confident in the crease as he was able to keep his focus and not get lost in all the excitement. This is an area, that Olivier has struggled so this was a good sign to see today. Pretty sure he will be playing with the Stockton Thunder this season but I think he very well may be ready for back up duty in the AHL. Many people are talking about him falling on the prospects list for goalies, but I wouldn't count him out. He has a lot of fight in him and looks to have matured quite a bit over this last year. Had one questionable goal scored on him but played fairly good. Seems to be really good with his leg work, with kick saves and all. Looks to maybe be a goalie that can cough up a few too many rebounds possibly. Had his legs on him today as he was flying. Could tell he was still trying to get his timing down on the plays. I'd be interested to hear what he has to say about being chased down on the PP late in the game by Nugent-Hopkins. Eventually he lost the puck to him but was a good battle. Hall is the type of player who builds momentum. The further along we go, the more people like what they see in Hall's game. 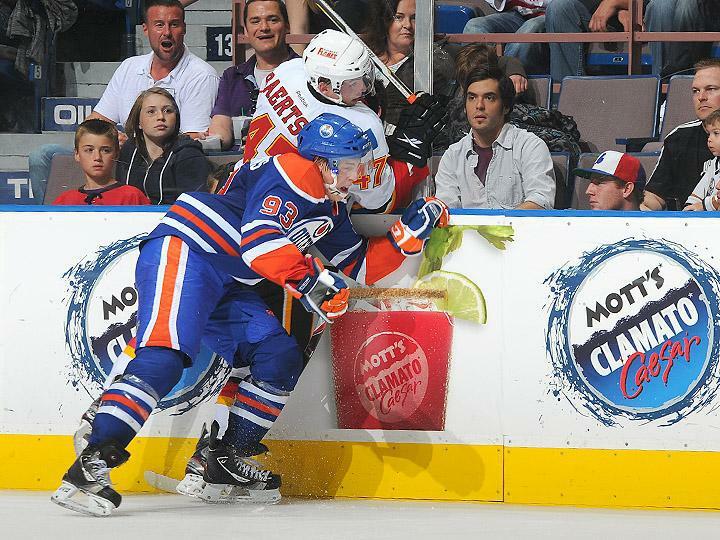 Lander seemed a little lost out there with Hall and Eberle. It's not that he did anything terribly wrong, but was caught a few times out of position chasing the puck. I am sure it's a big adjustment coming to a new country and starting to settle in some and get used to new systems. Again , as I mentioned before, I know it's early, but I see Lander taking some time in OKC to hone his game some. He is a quick learner, so if that happens, I expect him to exceed expectations. What a player. Thinks the game real well. Was really snake bitten Sunday afternoon though. Had several chances that he couldn't quite bury. The hands will come, it's still real early. Still hoping to see Eberle play with RNH. I really think they would feed well off each other well. The guy doesn't seem to age. He plays the game the way he has been taught. He knows where to go, how long to stay, when to let off the forecheck, when to get on the forecheck. Tough in the corners and on the puck and can still get to the puck well. His speed doesn't look any worse for wear either. Belanger looks like he likes it here. Reminds me lots of Jason Strudwick in his demeanor. Nice guy, and very confident with the puck. Set up the nice goal with Hartikanen. I like those two together, they would have some chemistry it looks like. Scored a sweet goal on a nice feed pass from Belanger. Teemu seems to have taken over where he finished off at the end of last year. He was quite noticeable out on the ice most his shifts and for good reasons. Hartikanen is going to really be pushing for a spot on the NHL club. Should he not be able to break the loaded forward line-up, the Barons will be more then happy, to get whatever time they can with him in OKC. man, this guy can skate. many times bigger guys don't look quick on the ice but still do well in getting from point A to point B, but Eager looks quick. Looks like a pretty big boy flying out there, and has some decent puck skills to boot. Looking forward to seeing what he brings to the table each night. Chris had a lacklustre game to me. I like him a lot but he did himself no favours in securing a centre spot on the Oilers with this audition. Barely noticed, except when losing face-offs. Hopefully since he starts slow but comes on later, all guns will be firing as each practice and game continues. Tanner played a decent game. Did not notice any mistakes in his game and seemed to execute the plays well. Is very confident with the puck and really likes to control the play. Scored a beauty goal with a nice top glove hand shot. I see Tanner doing quite well in OKC this year. The Barons are going to have some nice talent in their line up with skill like Tanner offers. Played his time on the wing Sunday afternoon. Great big body presence he brings. Here is hoping he doesn't go back to jr but right to OKC to get started on his pro development. At this stage , I see no need to send him back. he needs to development at a pro level with pro coach's. I know many have called for Petry to be sent down to OKC instead of someone else because he has waiver eligibility. I can't see this happening. Petry has started strong and looks to only continue. I know it's the first scrimmage but he looks miles ahead of some others in his development at this point. Let in a couple in a a half games work. Can tell he is a smart goaltender who has learnt to play a more simple game. Good positionally and had good lateral movement. All in all, a good fun time was had at the Joey Moss Cup. Next up? First pre-season games Tuesday evening. With the good young talent we have been drafting, the veteran presence that is being brought in and the growing stable already in place, 2011/2012 is looking to be a year of forward progress. So if your ready...."Let the games begin!" Ryan Nugent-Hopkins Is On Twitter!!! Ryan Nugent-Hopkins "Ready for PRIMETIME?" THE GRADUATE: "The Jeff Petry Story"
Kirill Tulupov Invited To Oilers Training Camp? "For the LOVE of Teubert"